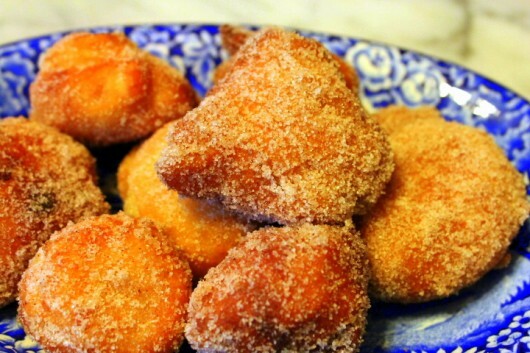 I LOVE THESE PEAR FRITTERS. I love them so much that I hope you’ll take them off my hands. Otherwise, I’ll be forced to eat them — rather joyously — all by myself. This recipe is slightly based on one I found in Fine Cooking Magazine. 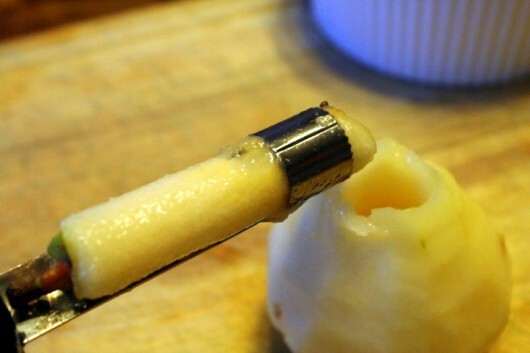 The “fine cooking” part is their perfect flavoring — pears, combined with lemon zest, fresh ginger, and cinnamon. Otherwise, they resemble “county fair” cuisine. You know, where everything delicious is deep fried. And then dice them up finely, and drop them into medium-size bowl. 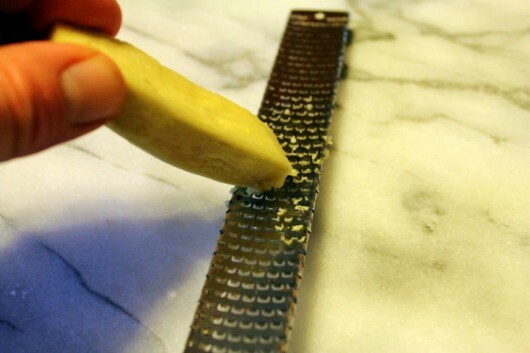 And peel it and grate it. 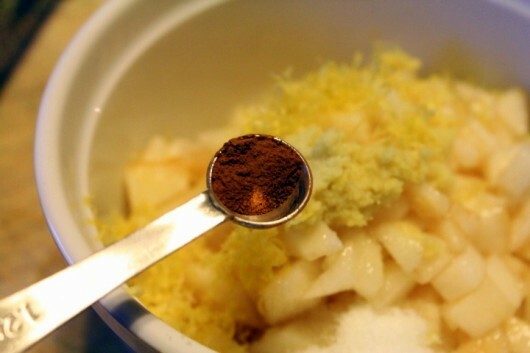 You’ll need about a tablespoon’s worth of the grated root. 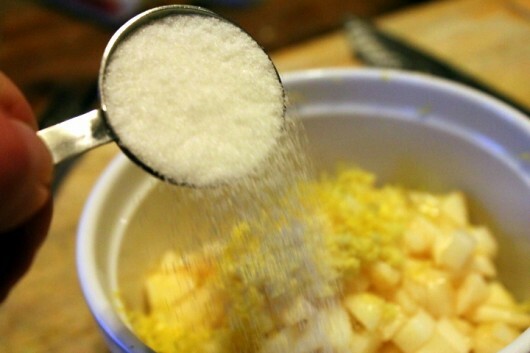 Add the grated ginger to the pears, along with the grated zest of one lemon. And a tiny pinch of cinnamon. Stir the works with a fork, and then set them aside. They need to macerate (exude their juices) for about 15 minutes. 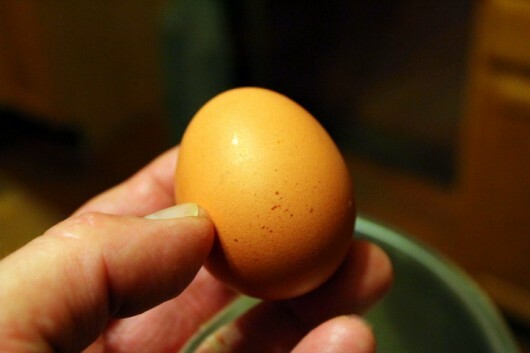 Next, separate 3 large, free-range eggs, and put the whites in a medium-size mixing bowl. and beat the whites until they form soft peaks. 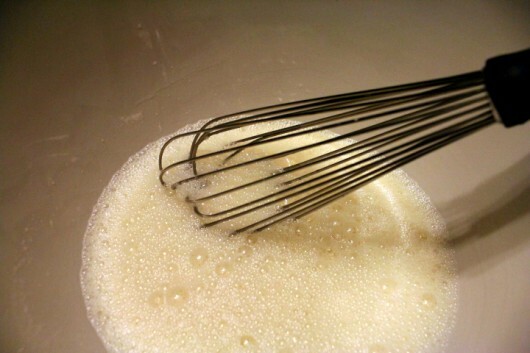 And beat them with a wire whisk until frothy — about 30 seconds. Yes, I realize we are using lots of bowls. But this recipe demands them. 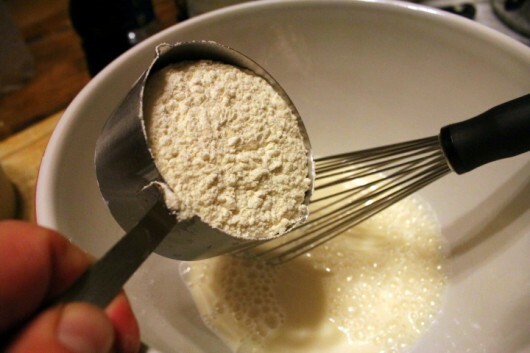 Whisk some flour into the milk mixture, taking care not to over-beat. The batter should retain a few lumps. I only ask because you’ve been awfully quiet. Pour one inch of flavorless vegetable oil into a heavy-base sauce pot or a cast-iron skillet. Heat the oil to 350°F. 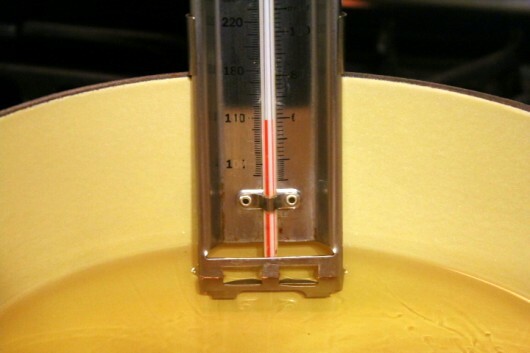 Unless you possess a knack for guessing oil-temperature, be sure to clip a candy thermometer to the side of your pot or skillet. 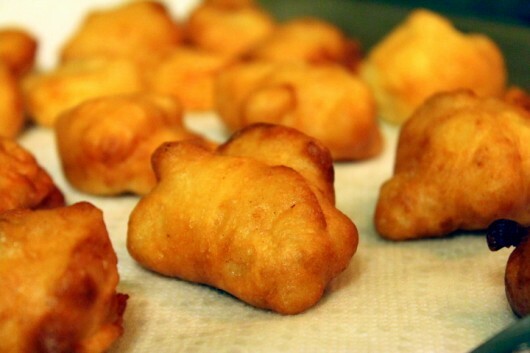 The right temperature will result in perfectly-fried fritters. Gently drop tablespoon-size clumps of batter into the hot oil (about 5 clumps at a time) — and let them cook until they brown on the top — about 90 seconds. Then flip them over and brown the other side. Using a slotted spoon, transfer the finished fritters to a paper towel-lined baking sheet. And then arrange the morsels on a pretty platter. 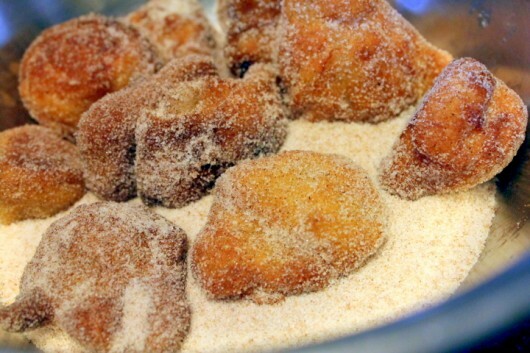 If you are a naughty adult (or a very nice child), you will absolutely love these fritters. The flavors of pear, lemon, and ginger must be tasted to be believed. I’ll bet you can’t eat just one. 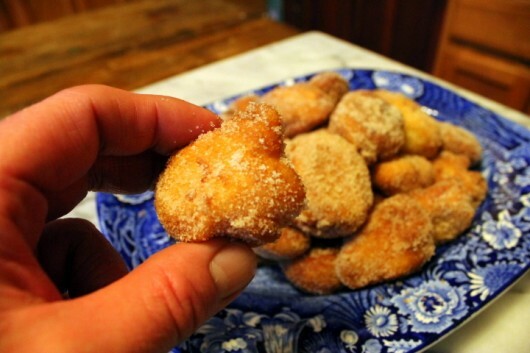 True confession: I ate 7 more fritters while writing out this recipe. 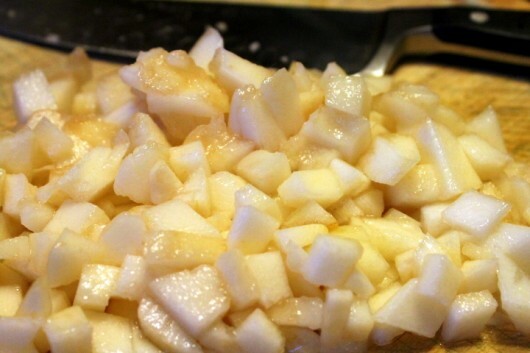 Pour the diced pears, the ginger and lemon into a small bowl. 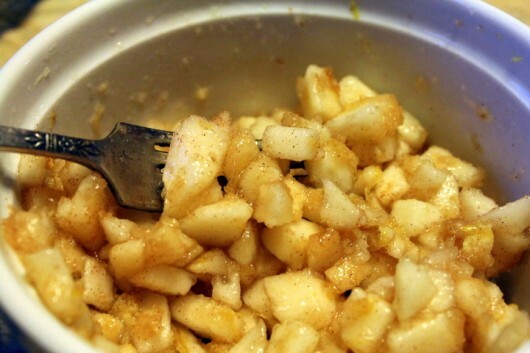 Stir in 1 tablespoon of sugar and 1/8 teaspoon of cinnamon, then let the pears macerate for 15 minutes. 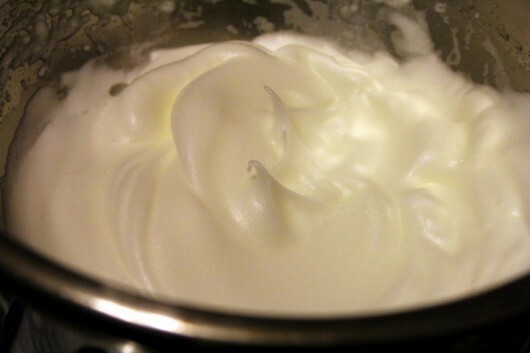 In a medium bowl, beat the egg whites to soft peaks. 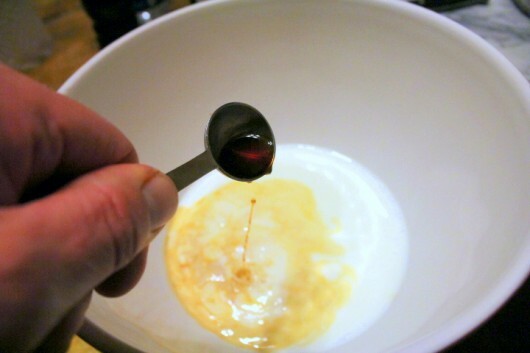 In another medium bowl, whisk together the milk, 1/2 cup of the sugar, and the vanilla until frothy. 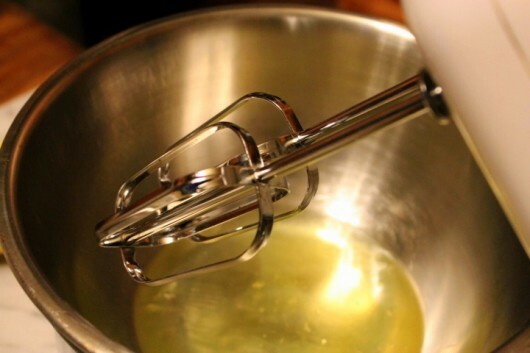 Whisk in the flour until just combined — the batter should be slightly lumpy. 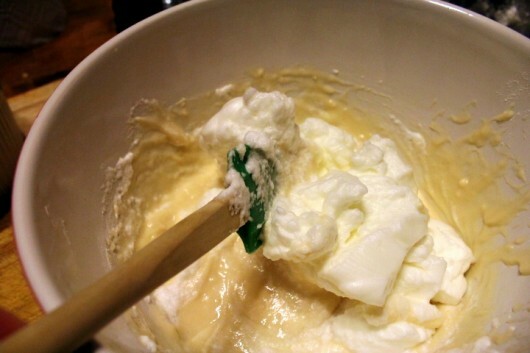 Using a rubber spatula, fold in the egg whites, followed by the pear mixture and all of its liquid. And in another bowl (or, you can use a paper or plastic bag), mix the remaining 1 cup of sugar with the 2 teaspoons of cinnamon. In a cast-iron skillet or a heavy-base pot, heat the oil to 350°F. Carefully drop spoonfuls of batter (I used a tablespoon) into the hot oil. You can cook 4 or 5 at a time. When brown on top, flip the fritters, and brown the other side. Drain on a layer of paper towels. 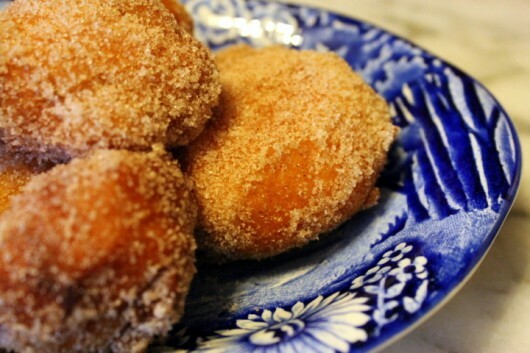 Roll (or shake) the fritters in the cinnamon-sugar, and serve at once. Christmas & New Year’s Recipe Roundup: Desserts! You had me at “state fair food”. I am a really bad judge of pears. When it comes to pears I am in agreement with Meg Ryan in City of Angels as she described the heavenly fruit to Nicholas Cage, the angel longing to partake in earthly delights, be they Meg or fruit. It seems to be a roll of the dice for me even when I think I’ve picked out a perfect one, especially when I’m relying on the local grocer rather than farmer’s’ market or neighbors w/ pear trees. But that will not deter me from trying this during my work-free week and 1/2. I love the sound of fritters. I am skeptical about the ginger with the pear, but I may have to try them. after I get a candy thermometer that is! I don’t have one of those. although, I did finally get myself a cast iron dutch oven covered in enamel. so, I am halfway to ready. I am so thankful that you shared these with me!!!! I LOVE ginger- and pear just goes so will with it!!! These little sugared morsels and addictive to be sure!!! Crispy on the outside, light and tender on the inside…. Yummy!!! That’s “are” addictive, not “and”….. also wanted to note I reheated some of these in the toaster oven this morning and that was a success as well!!!! Brenda – Good to know they reheat well. But how on earth did you manage to make them last until the next morning? Obviously your will-power is much stronger than mine! My oldest daughter loves pears. I think she is going to love these too! 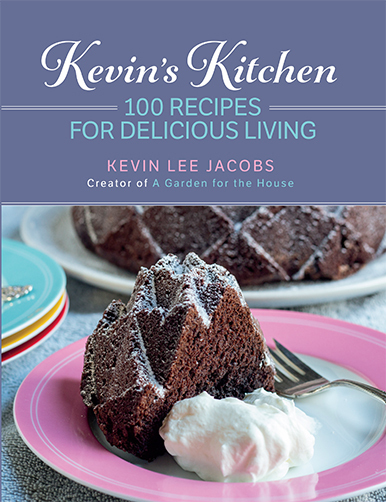 We were sent some wonderful pears for Christmas, too, so I’ll plan to set aside a couple to make these. Roughly how long did you find they cooked? (I know that at the right temp, going by the “browning” should give the right timing, but I just like to have a “feel” for what to expect. I’m considered to be a very good cook, but deep frying continues to confound me somehow.) 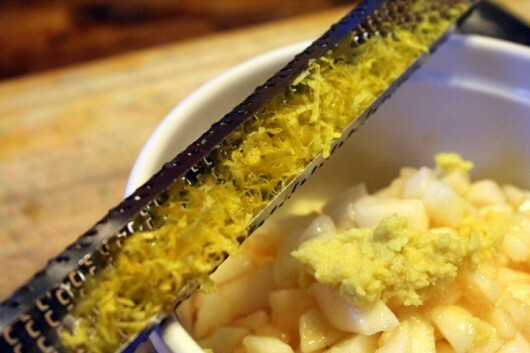 The ginger and lemon sound just wonderful with the pears! Love this recipe! Love your web page! Merry holidays to you and yours! Hi Arden – I cooked 5 fritters at a time, 90-seconds per side. Delicious! Enjoy your newsletter so much..the garden…the house…and the food! Have a Merry Christmas and the best in the New Year! Sounds yummy! I got everything home except the Pears. A perfect Treat for New Years Eve. Like every delicious recipe of yours, these are most likely no exception. and also Lily, Tiger and Camille. We can’t forget our Pets during this festive Season. Do they get “Special Treats too? 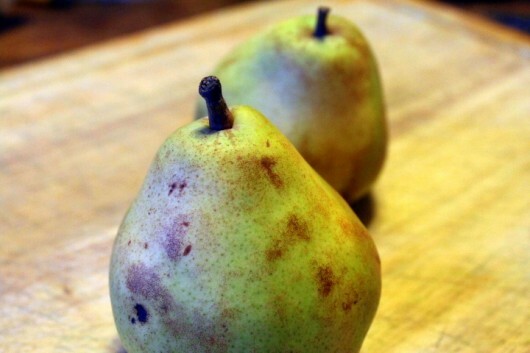 I am so happy to see this recipe because my to-do list for today includes cooking a big bag of pears from my frig, picked last September and starting to give up the ghost. I usually cook them with lemon and ginger and freeze them, but I still have some from 2012. The fritters should be a good change. The pears are comice and are usually very juicy, but the ones I have were picked fairly green and still have some body to them. Otherwise I would have to drain them before mixing them with the fritter batter. Thanks, Kevin, for the timing insight. Funny — I’m almost completely an “intuitive cook”, don’t really follow recipes, timing is very lax, etc. etc. but as I said, somehow frying still intimidates me so having a clue about what’s likely *really* makes me feel more comfortable. Many thanks! Your recipe photos and instructions are always so well done! I’m very impressed that you can prepare food, keep everything so neat and tidy, and take great pictures while you’re doing it! These fritters look fabulous. Thanks for another great post, and may your holidays be merry and bright! Kevin, what oil do you use for something like this? I’ve tried a number of different veg oils for this kind of thing and they’ve all brought in a flavor I really don’t like, stunk up the kitchen for days and generally been very unpleasant to use. You forgot to add the brandy. Looks and sounds delicious. 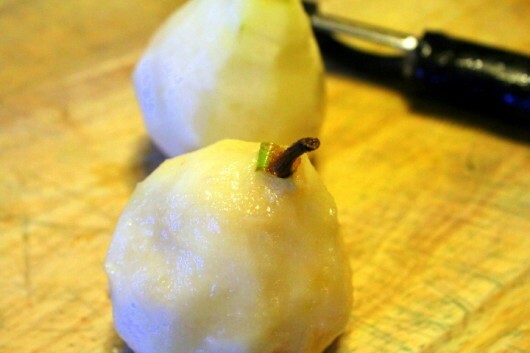 We had a bumper crop of pears this year, but they are all gone now, so will go out and buy some to try this. Merry Merry Christmas and a Happy New Year to Kevin, Partner, Miss Lily et al. We get together for coffee when he is not off gadding about with Dorothy. He loves pears but hates it when he wants one for his oatmeal and they are as hard as a rock. I see that he sent these across the country to you! He knows I am a cook and a gardener so I love your East Coast look and am soon getting out my milk jugs to start my seeds outside!. The prospect of Lemon Curd demanded that I buy a candy thermometer, so I am well-armed to attempt this luscious looking recipe. It’s gorgeous all around. another fabulous recipe to wind the season up neatly. 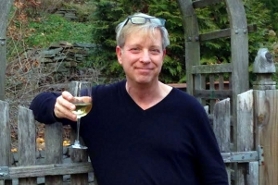 thank you for the year of great ideas and wonderful recipes along with entertaining, witty comments & photos. Made these tonight. I used Bob’s GF flour and about 3/4 tsp xantham gum in place of the regular flour, and that seemed to work, but if anybody knows a better flour to use for something like this, I would love to know. 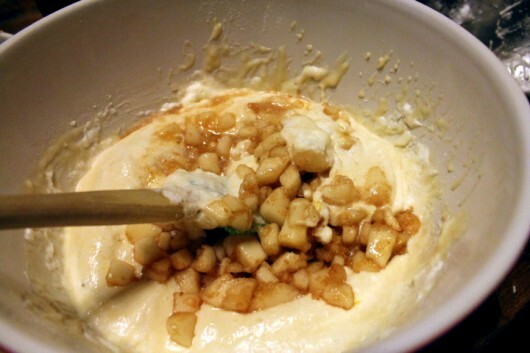 Also, I added a little nutmeg to the batter about half way through, next time I will try adding it to the pears. I am going to try these with apples too. Thanks for the photos, they help. And thanks for the great recipes. Okay, Kevin — I have to ask — did you ALWAYS say to cook for about 90 seconds in the instructions, and I’m just a doofus and didn’t notice that, or did you cleverly *add* that after I asked my question? I really feel like I try to read and re-read instructions when I think I’m missing something like that so that I won’t waste people’s time answering questions that were already answered, but I also *really* thought I had read and re-read your directions without a reference to how much time it had actually taken. So, am I crazy (and pestered you for no reason) and you’d already given the timing, or did you oh-so-cleverly go back in and add it after my question? Sigh, if it’s the former, my apologies! 😉 If it’s the latter, I’m sure others like me will appreciate it. all the best and have a wonderful New Year!! 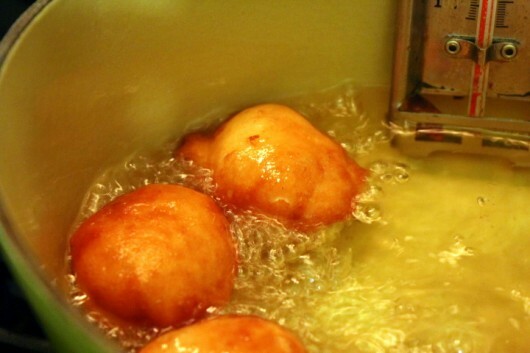 Hi Arden – I think the frying time was noted in my original recipe. The time — 90 seconds — worked for me when the oil was at 350°F. Hope you’ll try the fritters! mmmm…. sound fabulous! Thank you for sharing! We live in the country & buying fresh anything is almost impossible or cost is to high. Would you please indicate alternative uses for the ingredients? 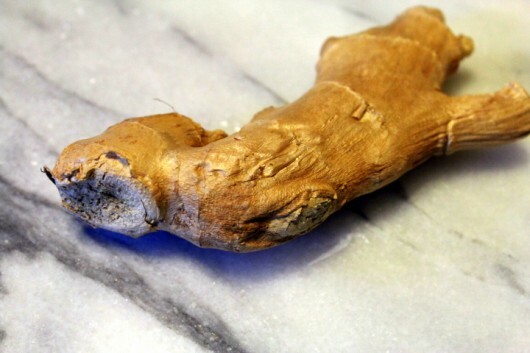 Such as, fresh ginger = ground ginger & how about not fresh lemon but lemon juice? One lemon here cost over .60 – for the rind, it isn’t worth it! Not on our income. Thanks & please keep the poor cooks in minds when you talk about using expensive ingredients! It may not be as good but close enough for most of us. I would only use coconut oil if I was making this recipe. There has been plenty of research about this. (Olive oil is also healthy but not for high temp cooking as it is unstable at heat and this changes the structure of the oil which has adverse effects on our health). The recipe sounds delish, though! Thanks for all the gardening tips.